4 Steps To Help Your Overweight Pet! One in four pets in the United States is obese, and every year owners spend thousands of dollars treating allergies, joint problems, digestive disorders and serious diseases that could improve dramatically with a few simple steps. 1. 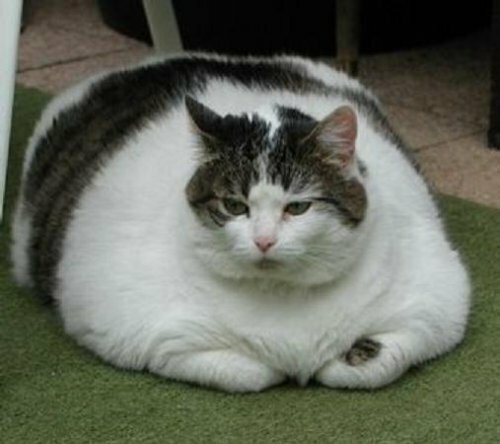 Determine if your pet is overweight. A good way to tell if your pet is overweight is to check out the pet weight translator. Simply click the link and follow the instructions to compare your dog or cat’s weight to that of an average male and female. This tool helps owners put their pet’s weight in perspective. 2. Visit your Veterinarian. Your veterinarian, can best determine what your pet’s ideal, healthy weight should be based on such factors as age and breed. He can also rule out any underlying medical issues. 3. Devise a Healthy Diet. Your veterinarian can help you devise a healthy diet and, “Sometimes it’s as easy as keeping a food diary,” says Dr. Ward founder of the Association for Pet Obesity Prevention (APOP). “Write down everything you put in your dog or cat’s mouth for a week.” In doing so, you may become aware of just how many table scraps and extra treats you’re unknowingly doling out, contributing to the problem. the years you’ll have with your four-legged friend. For tips on exercising your pet, click here. Braxton’s will be attending Sproutfest this Sunday at 11am. Make sure you stop by what is sure to be a fun and exciting event brought to you by Finding Shelter Animal Rescue!